Around the front legs of the skeleton horse is an electronic ticker tape showing the prices on London's stock exchange. 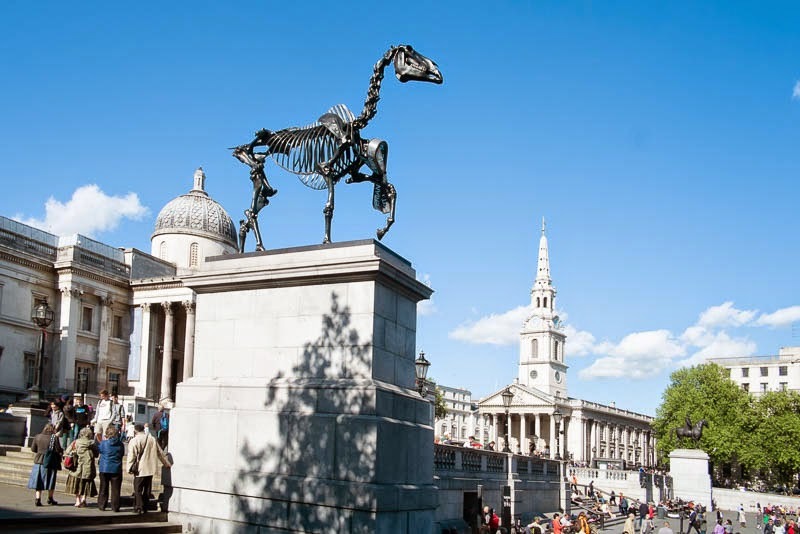 A symbol of the excesses of the market and a reference to the statue of William IV on a horse that was originally intended for the plinth but never happened due to a lack of funds. Artist and sculptor Hans Haacke says the work is "an invitation to think about whether the invisible hand of the market does promote general welfare or whether there's a misunderstanding, or whether it is totally wrong." Looking a gift horse in the mouth takes on a whole new meaning. It has to make you think a bit that's for sure. It is different to see like this.. It is funny how contemporary artists are always prone to criticize a system the allow them to thrive with works like this one. I love your shot of it! It sure gives you a lot to think about. I already like it better than the blue chicken. I loved the blue chicken! The whole concept of the plinth with different works is wonderful. I like this horse too and it is a good message. I like public art that makes us think. And I like how creative artists can be when expressing an opinion. I haven't properly been to see this yet. I looks like it needs some time spent contemplating what it really means rather than a fleeting visit, walking past it on the way to somewhere else. I will go, now you've reminded us. That is really something different!